Charge two tablets simultaneously, in your car. Do you carpool to work and need to flip a coin to see who will get to charge their tablet on the way to the office? Do you need to charge your tablet and phone at the same time, so that they're both ready to use by the time you reach your destination?Whatever your situation, this dual-port car charger offers a high-powered solution for charging two mobile devices simultaneously, while you're on the road.You can charge any Micro USB device, including your tablet or phone, using this convenient 2-in-1 adapter. 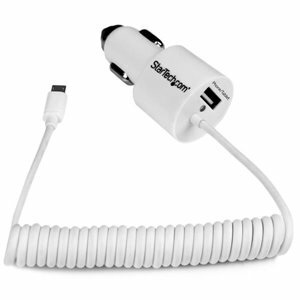 Plus, since the cable is attached directly to the charger, it won't ever get lost in your vehicle, or be just out of reach while you're driving.The integrated USB 2.0 port gives you the option to charge an additional mobile device such as your iPad or iPhone, at the same time.Don't have an Apple device? You can also charge Micro USB or Mini USB-enabled mobile devices with this adapter, such as a smartphone, tablet, or GPS using a USBHAUBMB1MW Mini/Micro USB cable.No matter what you choose to charge, you can always be sure you have the correct charge available for all your mobile devices.Each charge port provides 2.1A of power to assure that you have enough power to charge everything from a phone to a tablet. Whether you're charging two tablets at the same time or charging a phone and a tablet, you can be sure all of you mobile devices are ready when you need them. The integrated USB 2.0 port gives you the option to charge an additional mobile device such as your iPad or iPhone, at the same time, through either a Lightning cable or a 30-pin Dock cable. Don’t have an Apple device? You can also charge Micro USB or Mini USB-enabled mobile devices with this adapter, such as a smartphone, tablet, or GPS using aMini/Micro USB cable.